Electric Utility Vehicles Claiming Market Share? This story exemplifies the potential for electric powered utility vehicles to make inroads into gas powered segments of the market. In this case, an electric powered Club Car replaced an older Gator utility vehicle in a county park. The lack of noise and odor emitted by the vehicle is noted as the advantages of the new vehicle. On the other hand, the staff remarked that the vehicle can only be used on the more developed parts of the park and not the trails, and cannot be operated all day or the power runs out. The vehicle is used for regular maintenance around the park. They did receive a number of favorable letters and calls from park users about the vehicle. Comment: In much the same way utility vehicles have replaced full-size trucks when appropriate, I can see electric powered utility vehicles replacing gas powered vehicles or being the first vehicle of choice where they can perform just as efficiently, especially as the “going green” trend continues. However, except for vehicles like the Bad Boy Buggie, most of the electric utility vehicles will still fall short in some key performance requirements for the more demanding tasks required of gas powered vehicles. If all goes according to plan the Maya 300 will be available this summer in the US and Canada. The LSV will be available with either a 12 KW or 18 KW Lithium ion battery pack, which will give the vehicle a range of 80 km or 120km respectively. Produced by Electrovaya, the LSV will be priced around $20,000 and will be assembled in either Mississauga, Ontario, or Malta, NY, the final decision is yet to be made. These will be a combination of traditional car dealers as well as a new type of dealer who exclusively sells electric vehicles and combines several manufacturers such ZENN, ZAP, and MILES in one dealership. Wheego is a division of RTEV which produces electric vehicles for recreational use under the Ruff & Tuff brand and vehicles for street use under the Wheego brand. An EESU (Electrical Energy Storage Unit) weighs 281 pounds, has a volume of 2.63 cubic feet, can be fully charged in 3-6 minutes, is completely unaffected by temperature, will not explode or catch fire in an accident, and provides 52 kWh of electricity. You know how the Beetle was the vehicle of choice for the whole ’60s, the hippie revolution and everything? We’re hoping that this becomes the new-wave car for the younger set as well as addressing mom and her needs with her kids. Comment: If they do produce a utility vehicle what will that mean for GEM which sells a large number of vehicles configured as utility vehicles. It seems like it would put the companies in direct competition. The other question is whether or not NEVs with their limited mobility will appeal to a younger and presumably more mobile market segment. The tax credit for NEVs made it into the final stimulus bill recently signed by Obama. The tax credit is for 10% of the purchase price of the vehicle with a maximum credit of $2,500. Three wheel vehicles like those produced by ZAP will also be eligible. Numerous blogs and websites are recycling the same political spin in opposition to the stimulus bill. Typically the headline includes the phrase “$300 million for golf carts”. (Here is an example) The story then highlights NEVs from a list of electric vehicle types that would be eligible for federal funding under the bill and conflates NEVs/LSVs with golf carts. Whether you are for or against the stimulus bill, this is another example of how various media outlets and others are blurring the line between NEVs/LSVs and golf carts. In the past, the blurring has had more to do with vehicle safety issues. In both cases, the blurring is to the detriment of NEV/LSV manufacturers. If this trend continues, NEV/LSV manufacturers may have to more aggressively and clearly delineate the differences between NEVs/LSVs and golf carts in order to protect the generic NEV/LSV brand and their specific brand of NEV/LSV. A local news story reports that Philadelphia based BG Automotive is looking for manufacturing sites in the Boston area including Bridgewater, Taunton, Fall River and New Bedford. The facility will be for mass production of their C100 neighborhood electric vehicle and employ about 150 people per shift. The company is looking for a site for a 60,000 – 100,000 square foot facility and is currently seeking funding. Since the vehicle’s parts are imported and most of the activity at the facility would be assembly the company expects vehicle production could begin in as little as four months once a facility is found. The chassis and body of the vehicle are imported while components like the motor, controller and batteries are manufactured in the U.S. 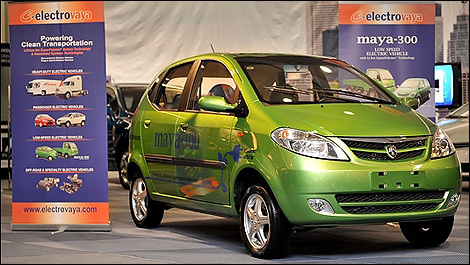 Delivery of the first vehicle is expected to be in April or May of 2009 according to the company’s website. The company is planning to develop six facilities in the next 24 months for a total production of about 100,000 vehicles by year-end 2010. I thought these latter figures were quite aggressive so I placed a call with BG Automotive and was able to speak with Barry Bernstein, the founder of the company. He confirmed that the company is looking to develop six facilities with the ability to produce around 15,000 vehicles each annually. While our estimates of the LSV market size the market at less than 10,000 vehicles a year, Bernstein noted that interest in their vehicle has been higher than expected with over 44,000 people signing up on their website. No deposit is required to sign up initially but as the actual production date moves closer a deposit is required. Bernstein also noted that the facilities will be designed to easily switch over to highway-speed electric vehicle production which is in the company’s long term plans. Besides Massachusetts, the Philadelphia based company is also looking to place facilities close to major LSV markets including California, Georgia, Texas, Northern Florida, Pennsylvania and the Tennessee – Kentucky area. They are applying for loan guarantees and other support from both federal and state agencies but will be able to scale down their facilities if they cannot garner this support. Bernstein expects to have more information on their site selection in about two weeks. Tanfield will licence Intellectual Property Rights (IPR), brand and all existing sales and sales enquiries in North America to SEVUS, in exchange for a 49% equity stake in SEV US Corp and per-vehicle royalties. As a majority (51%)-owned US company, SEV US will be eligible for US government funding and other benefits. Production of the vehicles is expected to begin in 2009. Tanfield has scaled back from their plans to develop, on their own in the US, a major production facility with a capacity to produce 10,000 vehicles a year. North America remains the largest potential market for their commercial vehicles.